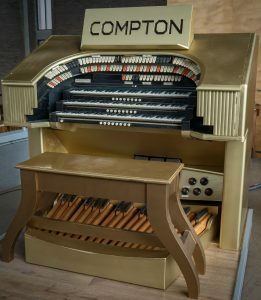 The Compton organ was originally installed in the Ritz (ABC) cinema, Nuneaton and played on the opening night, 22 July 1937, by Alex Taylor. The organ was designed by Harold Ramsay and contained the following 6 units of pipes: Wooden Tibia, Tromba, Diapason, Strings (2 ranks) Krummet and Flute. There was also a Melotone and all played from a 3 manual console which had a ‘Union’ style illuminated surround. Union Cinemas had built the theatre, but it was opened by ABC who had taken them over that year. Alex Taylor stayed for two weeks after which the organ was visited by the ABC team of organists weekly. Douglas Walker gave the organ its first BBC airing in June 1938 and it was also broadcast by Trevor Willetts, George Blackmore and Molly Forbes. The organ was kept in good order despite having been taken off the maintenance list in 1967 before it was purchased for a home installation. However, this didn’t happen and it was bought by Father Gerard Kerr, who had already installed a Compton organ in his previous Church at Hornchurch, and installed in St John Vianney RC Church. The organ was playing again by November 1968. All percussions and effects were retained as was the Melotone, and the organ has since been used for concerts regularly by the COS and has been featured on BBC Radio 2s ‘The Organist Entertains’ by Dudley Savage, Stanley Wyllie and Nigel Ogden who has also recorded the Compton for the COS. This church installation is quite well known and greatly appreciated by some of the top organists in the UK. Although small by some comparisons it provides a very rich sound which is enhanced by the brick and glass finish of the building’s interior. This provides for considerable reverberation within a relatively small church.